Ram Vilas Paswan, Union Minister of Consumer Affairs, Food and Public Distribution has said that to provide justice to consumer is priority of his ministry. Shri Paswan observed that mediation has ingrained in our culture, and in tune with that the Consumer Protection Bill, which is at an advanced stage, has a provision for mediation. Union Minister said that the new bill has stringent provisions against misleading advertisements and unfair trade practices, which will be tackled effectively with setting up of the Central Consumer Protection Authority. Shri Paswan said that celebrities should check facts about the product before doing endorsement. 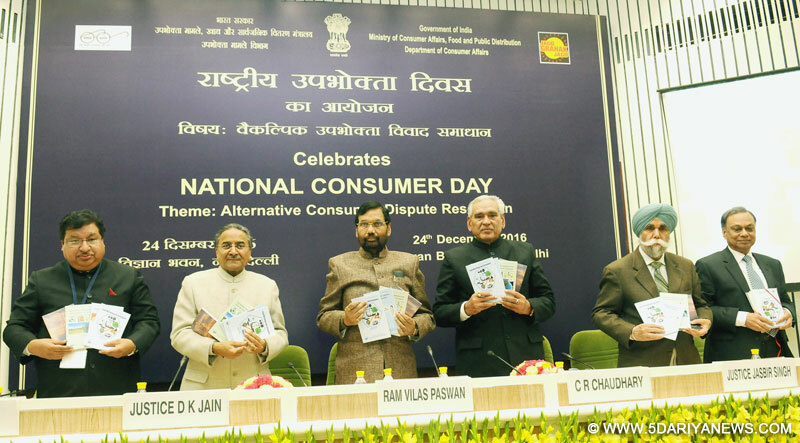 Shri Paswan stated it at the inauguration of the National Consumer Day celebrations in New Delhi today.The Department of Consumer Affairs, Ministry of Consumer Affairs Food and Public Distribution, celebrated the National Consumer Day 2016 with the theme “Alternative Consumer Dispute Resolution”. The event saw the introduction of new initiatives of the Department on consumer grievance redressal and consumer education, leveraging new age technologies were launched which included, i) a mobile app, and an easy to remember number 14404 to access the national consumer helpline, ii) Online Consumer Mediation Centre (OCMC) , at National Law School India University , Bengaluru, iii) A Mobile app ‘smart consumer” which is a bar coder as well as platform for lodging consumer grievances against packaged commodities; iv) Online Consumer communities on the digital platform “Local Circles” for presenting their views , grievances and suggestions enabling the Department to know the pulse of the public that may help in policy making; v) Launch of a Microsite with the theme “Digitally Safe Consumer Campaign” with knowledge support from Google, to help Indian consumers stay safe on the internet. Various publications by Centre for Consumer Studies, IIPA on - Legal Metrology and Consumer, Electricity and Consumers, Sustainable Consumption and lifestyle and Non-Banking Financial Companies (NBFCs)-Regulations & Consumers, were released.Shri Ram Vilas Paswan mentioned that enhanced capacity of the National Consumer Helpline will benefit lakhs of consumers. The Minister commented that this is the age of technology, and educating the consumer and redressing his grievances in the digital world is a challenge. Hon’ble Prime Minister, Shri Narendra Modi has given a message to the citizens to adopt less cash lifestyle which will help in fight against black money and corruption. This will add crores of Indians to the digital world for the first time. The Mobile App of the consumer Helpline, the Smart Consumer App for accessing product information, online communities will benefit the consumers in the digital world. The microsite for consumer safety in the digital world, made by the Department along with Google will help the consumers for being vigilant and not fall prey to cyber frauds. Online communities will provide a platform for airing their views, experiences and grievances.Shri Paswan welcomed the online consumer mediation initiative of the Department with the National Law School, Bengaluru and advised that before starting of the mediation it should be ensured that mutual consent of the consumer and the company are ensured and the proposed nominal fee should be charged on both the parties and not just the consumer. Shri C.R Chaudhary, Minister of State for Consumer Affairs, Food and Public Distribution said that intention of the Government is to bring forward, shortly, a broad-based Mediation system to promote mediation as a viable, effective and efficient alternative to court proceedings, thereby reducing legal costs and speeding up the resolution of disputes. Shri Chaudhary mentioned that the legislation, which is currently being drafted, will provide that a consumer commission may, following the commencement of proceedings, on its own initiative invite parties to consider mediation and suspend the proceedings to facilitate the mediation process. The Minister of State mentioned about 5 regional helplines which are being planned as extension of NCH in different zones of the country. Shri. C.R. Chaudhary requested all delegates present in the event especially the VCOs to support cashless system as part of PM’s demonitisation programme and help in creating awareness among consumers of its benefit.Welcoming the delegates on the inaugural function Shri Hem Pande Secretary, Department of Consumer Affairs said that the Department has been keeping abreast of the latest challenges to consumer protection and has been devising various strategies to protect consumers from exploitation.Justice D.K. Jain, President, National Consumer Disputes Redressal Commission (NCDRC), Justice Jasbir Singh, President, Chandigarh UT Consumer Commission, and Sh. B.C. Gupta, the Member, NCDRC graced the occasion and addressed the participants on the theme.